Once affectionately described as “barnacle-encrusted plywood motor boat hardly bigger than a stockbroker’s cabin cruiser,” mention of PT Boats usually triggers memories of former President John F. Kennedy’s PT 109 exploits, the 1945 John Wayne movie “They Were Expendable” and of course, the 1960’s television show McHale’s Navy. 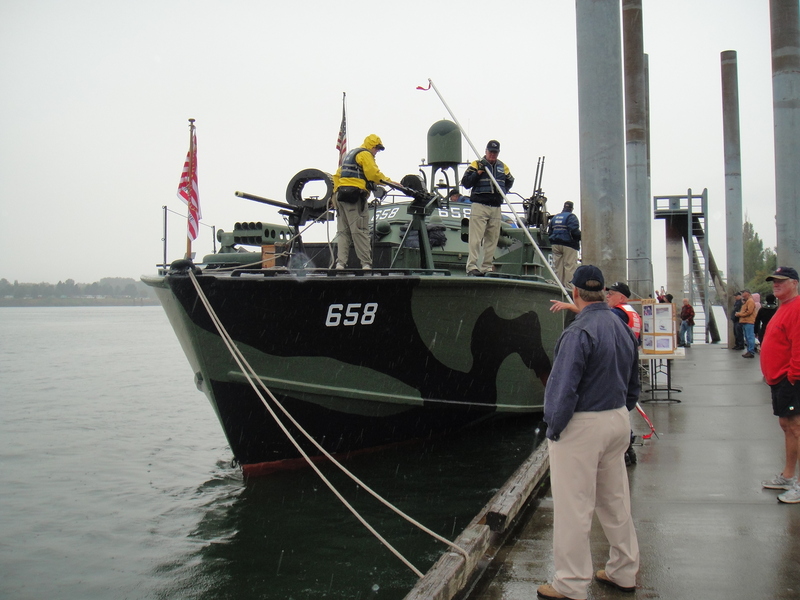 Whatever vision they stir in us, PT Boats served an essential purpose during World War Two. Light weight, small and fast, they would go up against much larger and heavily armed vessels with their torpedoes. Hundreds were built with many lost in combat, some needing scuttled, given to allied countries and once the war ended, sold off as scrap, many being converted to pleasure craft, leaving but a handful in existence in the world, all but one that has been restored on static display in Naval Museums. That one, PT 658 is the only restored and operational PT Boat in the world and is moored in Portland, Oregon, right here in our own backyard. Manufactured by Higgins Industries in New Orleans, PT 658 was completed on July 20, 1945 shortly before the cessation of hostilities, keeping her from being sent into harm’s way. Originally scheduled for transfer to the Soviet Union, our ally during the war, PT 658 ended up being shipped to Bremerton, then stationed at Port Hueneme, California where once reclassified as a ‘Small Boat,’ served as a missile range patrol boat in 1946. She was reclassified as Floating Equipment in 1948, then transferred to Naval Air Station Point Mugu where the Boat was used for patrolling the Point Mugu missile test range for stray craft into the missile landing area, and for towing targets. In 1958 she was sold to a private individual who converted the Boat into a pleasure craft and renamed her ‘Porpoise.’ She was purchased from the estate of Mr. Orlando Brown in Oakland, CA in 1993 in bad need of restoration and brought to Portland by a group of Veterans that had formed Save the PT Boat, Inc. Ten years later and after untold thousands of primarily unpaid volunteer man-hours, PT 658 cruised the Willamette River for about 45 minutes with former PT Boat skippers taking the helm of the restored to original configuration PT Boat, once again under the power of three Packard 1850 HP V-12 engines. The goal to restore PT658 to her “as-built” condition to be used as a living history display had been met and has been maintained, appearing at numerous community and Veterans events around the Pacific Northwest, supported by generous donations from the public. In September 2012 PT 658 was placed on the National Historic Register. Unfortunately, that same year, during a routine full bottom survey required by the U.S. Coast Guard, an alarming amount of dry rot was discovered in much of the above water planking, requiring a little over $220,000 in repairs, the bulk of which, the labor was to be handled by volunteers overseen by shipwrights. And if that wasn’t bad enough, weeks ago some low-life’s broke broke into a shed and stole over $6,000 worth of the tools volunteers were using to repair her. Save The PT Boat, Inc. is now asking for help to meet the balance of what it is costing to repair PT 658 and to replace the stolen tools. I realize times are tough and money is tight, but your donation, no matter how small will be used to preserve a piece of history few ever have a chance to see, a fully operational and restored World War Two Patrol Torpedo Boat as it was originally built. This request is not political and every dime donated goes to repair this Historical Treasure, not some politician seeking campaign money. You can make donations directly to the effort at Donation/Contact or through Save PT-658 where I made a donation. 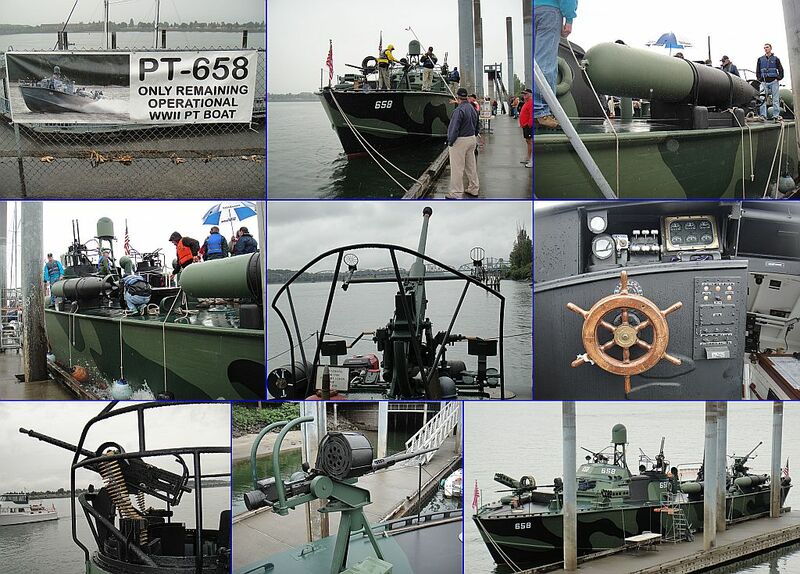 Unlike the small handful of PT Boats restored and on static display back east, PT 658 remains the only operational PT Boat in the world. It is a virtual floating museum from World War Two in the Pacific Northwest. I hope you will join me in helping to preserve this Historic Treasure. Thanks for posting this Lew. I’d heard of the project before but wasn’t aware of the status. Craig, the boat is a sight to behold. Since PT’s were before I was born I was elated to go onboard and walk through her when they brought her over to the Vancouver Landing a couple years ago, that I when I took the photos in the collage.